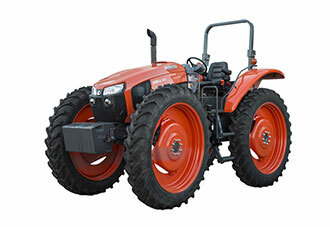 Kubota M6H-101 High Clearance tractors lead the way in the vegetable and fruit row crop markets. With more standard ground clearance (25.8 in.) than the competitors in its horsepower class, the M6H-111 will add more productivity and peace of mind to your specialty crop operation. And, when slow speeds are crucial, the M6H-111 boasts some of the slowest ground speeds in the market at 0.11 mph, with a standard, factory installed creep speed range. PROVEN, POWERFUL AND RELIABLE KUBOTA DIESEL ENGINES: The M6H-101 tractor line-up is powered by Kubota’s proven and reliable V3800, 3.8 liter, turbocharged, Tier 4 Final diesel engine. With 97 net engine HP and 84 PTO hp, M6H-101 tractors are ready to plant, spray and harvest, as well as put power to the ground to prepare and cultivate your fields. HIGH CLEARANCE FRONT AND REAR AXLES: When ground clearance is the key to your operation, Kubota’s high clearance tractor’s front and rear axles stand above the competition. Kubota’s bevel gear front axle provides more ground clearance than the competitors’ straight, u-joint front axles by lowering the final drive hub, allowing the axle housing to rise over the crop. Both the front final drive and rear drop box axle ride within the wheels, not limiting critical ground clearance. When wide tread settings are required, wide axle spacer kits are used, allowing the front final drive and rear drop box to remain within the front and rear wheels to not limit ground clearance (unlike the competition). KUBOTA EXCLUSIVE SWING-SHIFT TRANSMISSION: When finding the right speed for your operation, the M6H-101 comes ready to work in the field. With the Kubota exclusive Swing-Shift transmission 24 speed Swing-Shift transmission, you’ll always be able to find the right gear. The M6H-101 offers 8 speeds in each of the high, low and creep ranges to get you down the road quickly or crawling through the field with slow speed precision. Kubota Swing-Shift Transmission shift handles have an integrated “de-clutch” button to allow the operator to shift gears without using the foot pedal clutch, reducing operator fatigue throughout the work day. ERGONOMIC OPERATOR’S STATION: The M6S-111’s operator’s station has been ergonomically designed for functionality and operator comfort. With well laid out controls and excellent visibility, the operator will be comfortable and well aware of the area around the tractor during operation.